The following list is a guide to some of the technical terms applied to invertebrate prey types encountered in fish stomachs, but it is not an exhaustive list by any means. Usually no bigger than a fingertip, amphipods are small crustaceans that form a very important prey base for our small and juvenile fishes. Most of the amphipods we identify are laterally flattened, like the common burrower amphipod and four-eyed amphipod. Some are dorso-ventrally flattened, like Corophium spp. Also classified as amphipods are the unique skeleton shrimp, commonly found in stomachs of structure- or seagrass-associated predators. Clams, mussels, scallops, and oysters belong to the taxonomic class, bivalves. We frequently find clam parts, whether they are broken shell pieces or the soft foot or siphon, in the stomachs of adult bottom feeders such as drums, skates, and stingrays. We seldomly find whole bivalves, so identification to species is rarely successful. Some common bivalve prey species that are distinctive enough to positively identify are the common razor clam, stout tagelus, and ark shells. Bryozoans, sometimes called moss animals, are tiny individuals that form colonies. The colonies encrust submerged surfaces. 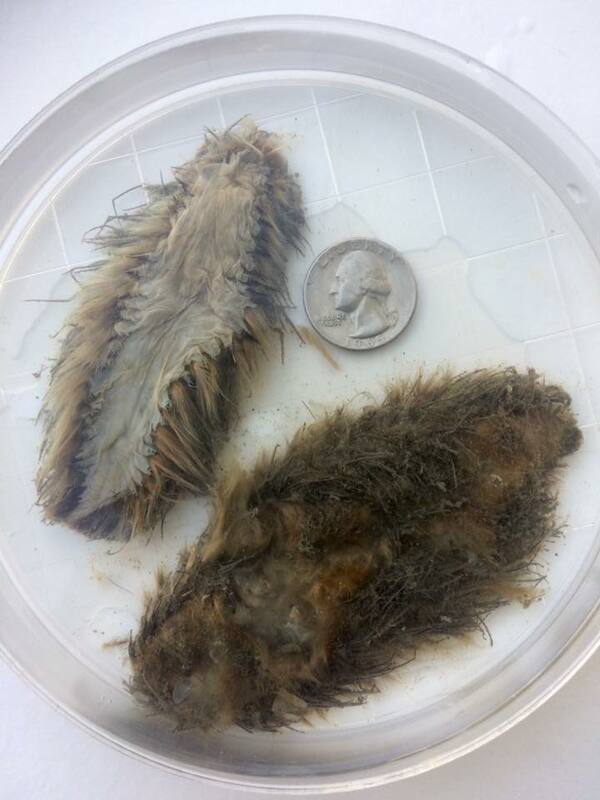 When we find bryozoans in fish stomachs it is unclear whether the bryozoans are incidentally ingested by the predator or being targeted as prey. Massive colonies of the bryozoan we call dead man's fingers are frequently encountered in the trawl net during our monitoring cruises. We categorize these colonies as habitat, so perhaps it's safe to assume a predator was foraging in the habitat targeting more definitive prey items and ingested the bryozoan incidentally. Squid belong to the taxonomic class, cephalopods, which also includes the octopus and nautilus. 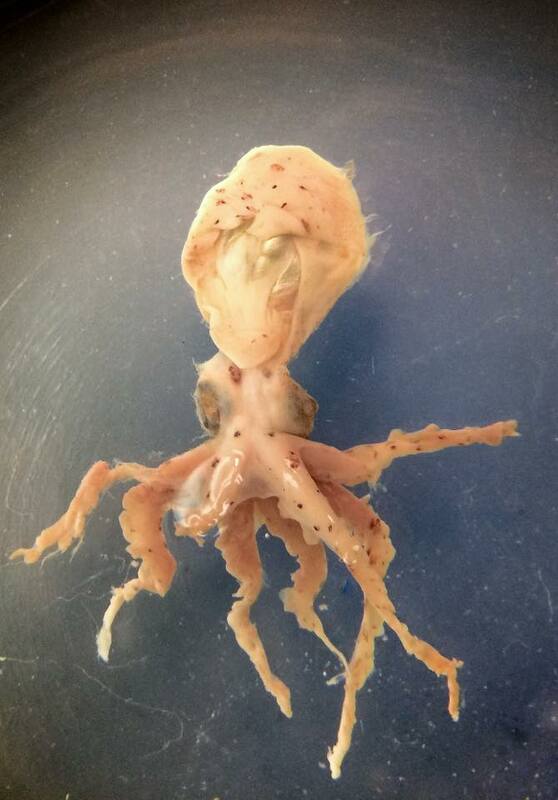 Although we identified only one octopus as a prey item, squid are commonly eaten by large piscivores such as summer flounder, bluefish, dogfish, and clearnose skate. The longfin inshore squid is not only an important prey type for these predators, but it is also an important commercial fishery resource. The most popular cnidarians are jellyfish and comb jellies. Although these taxa are difficult to significantly quantify in our diet analyses, we have some evidence of jellyfish being eaten by butterfish, harvestfish, and Atlantic spadefish. Cnidarians also include sea anemones and hydroids, which we occasionally identify in winter flounder diets and even less frequently in a few other species. Massive colonies of hydroids are frequently encountered in the trawl net during our monitoring cruises. We categorize these colonies as habitat, so perhaps it's safe to assume a predator was foraging in the habitat targeting more definitive prey items and ingested the hydriod incidentally. Calanoid copepods are an important prey type for small and juvenile fishes, especially in the shad and herring family. 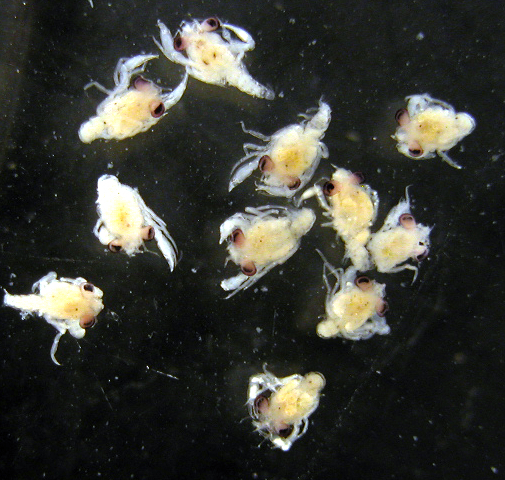 These crustaceans are tiny, most less than 1 mm, but very abundant as zooplankton in the water column. Decapods encompass the very large group of crabs, shrimps, and lobsters. These are some of the most important prey types for a diverse array of predator species of various life history stages. The most frequent decapod we encounter in fish stomachs is sand shrimp, a small shrimp whose presence is nearly ubiquitous in the diets of fishes of all sizes. Other common shrimp we encounter are the long-eyed estuarine shrimp, bristled longbeak, roughneck shrimp, and short-browed mud shrimp. Mud crabs are consumed by Chesapeake Bay species, while fishes in our nearshore Atlantic habitat consume Atlantic rock crabs. 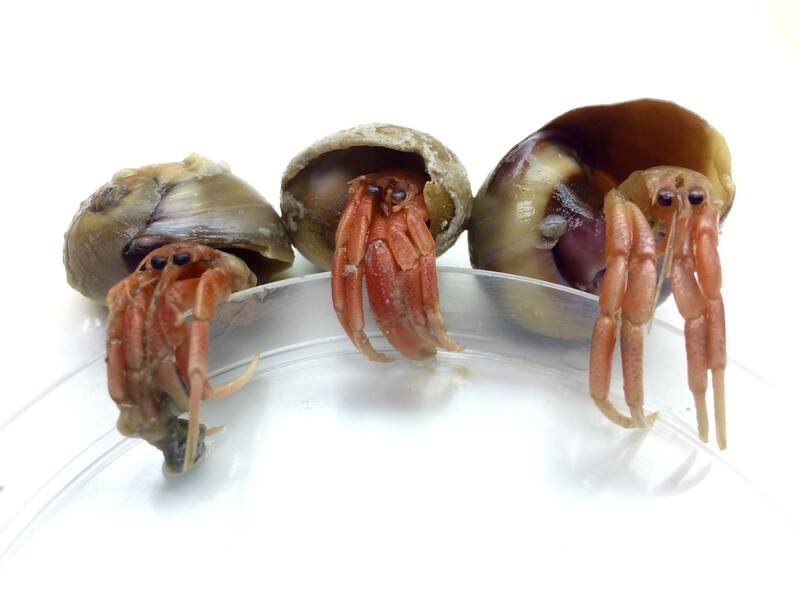 Hermit crabs and lady crabs are commonly eaten by fishes in both habitats. Decapods are even consumed as larvae, called zoea or megalopae, in the zooplankton along with copepods, by the smallest fishes. Echinoderms include sea cucumbers, sea urchins, sand dollars, sea stars, and brittle stars. So far, we have only seen brittle stars and sand dollars in significant quantities, and even those were relatively rare. All of the brittle stars and sand dollars we identified were broken up in pieces in the stomachs primarily of scup, Atlantic croaker, and Northern puffer. Many common names have been given to these animals, but for us gastropod refers mainly to snails. Unfortunately the majority of snails we encounter in fish stomachs are too small or crushed to identify to the species level. However, the barrel bubble is distinct and common enough that we know it when we see it. Often the shape or size of the snail's operculum, or the hard covering over the opening of the shell, that allow us to identify the moon snail or New England dog whelk, both of which we find relatively frequently. Isopods, like amphipods, are small crustaceans that resemble the pill bug you see on land, but are obscure enough that many do not have common names. We find them mainly in the diets of smaller fishes. They are generally larger than amphipods and are always dorso-ventrally flattened. Isopods differ in appearance between the species enough that they usually can be positively identified. The most commonly identified isopod in our nearshore Atlantic stomach samples is Politolana concharum. In the Chesapeake Bay, interestingly, the most common isopod identified is a parasitic species, Livoneca redmanii. The mound-back isopod, slender isopod, Chiridotea spp., and Sphaeroma quadridentatum are also common prey items. Anything we cannot identify as animal or plant, or cannot differentiate as animal or plant from other unidentified material in the stomach contents is classified as miscellaneous. Included in the miscellaneous category are any animal or plant parts that are too digested to identify as such; mineral material like rocks, sand, or mud; other organic material or detritus; animal tubes; and artificial material such as trash or fishing lures. Artificial material is relatively rare, but always interesting to find. In Chesapeake Bay food webs, mysids are one of the most important prey types for smaller fishes using the Bay as foraging habitat prior to reproductive age. Mysids are small crustaceans (<1 cm), sometimes called "oppossum shrimp", although they are not shrimp. A key feature in differentiating a mysid from a small shrimp is the presence of statocysts, a pair of tiny bubble-like structures embedded in the tail. The shape of the tail can help identify the mysid to species level. The most common mysid we find is Neomysis americana, ﻿followed by ﻿Americamysis bigelowi﻿. Sometimes we find these two species together in a sample, and in great numbers, so we cannot reasonably identify them all to species level. Arthropods are taxa that include crustaceans, but also insects, spiders, and horseshoe crabs. The taxonomic grouping of crustaceans is very broad and has many subgroups, including decapods, amphipods, isopods, mysids, copepods, and stomatopods. All other crustaceans we find are infrequent enough that we can group them together into one category. Like copepods, most are zooplankters: cumaceans, cladocerans, tanaids, and ostracods. We also include barnacles, which have a planktonic larval stage. Any type of vegetation we find in stomach samples is grouped into the plant category. We can identify sea grasses, seaweed or macro algae, leaves, and seeds if they are in good shape, but most often the vegetation remains unidentied or identified as detritus. It is unknown whether our fishes deliberately consume the vegetation for nutrition, but it seems more likely the plants are ingested with animal prey using it as habitat. Plant material identified in our fish diets is relatively uncommon, but we have quantified some in winter flounder, winter skate, smooth dogfish, and Atlantic croaker. Stomatopods are an important prey type for larger age class predators in both the Chesapeake Bay and nearshore Atlantic habitats. Stomatopods, also called "mantis shrimp", are crustaceans, but are not true shrimp, which are decapods. Stomatopods are quite distinct from shrimp in that they are dorso-ventrally flattened and have distinct head, body, and tail regions. While we do find stomatopod larvae, and smaller juvenile specimens, we encounter adult forms greater than 8-10 cm most frequently. 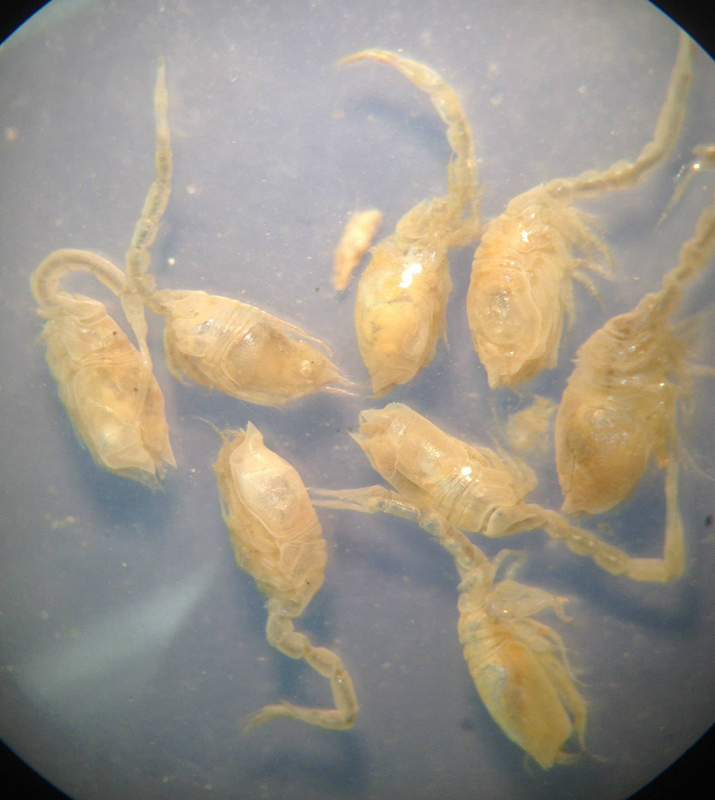 In Chesapeake Bay, we identify exclusively ﻿Squilla empusa﻿, and in the nearshore Atlantic, we have found ﻿Nannosquilla grayi﻿, and ﻿Platysquilloides enodis﻿. Otherwise known as sea squirts, tunicates are colonies of indivuals whose size varies from species to species. Although tunicates are relatively rare in our fish diets, the genus we most frequently encounter is Molgula, which has large and globular individuals. Rarely, we will encounter a stomach containing eelgrass with a tunicate colony encrusting it. When we find Molgula in fish stomachs it is unclear whether they are incidentally ingested by the predator or being targeted as prey. Massive colonies of Molgula are frequently encountered in the trawl net during our monitoring cruises. We categorize these colonies as habitat, so perhaps it's safe to assume a predator was foraging in the habitat targeting more definitive prey items and ingested the tunicate incidentally. Worms are an important soft-bodied prey source for small and large bottom feeders like Atlantic croaker, spot, winter and little skates, and winter flounder; but large worms are also consumed by voracious predators like striped bass. The vast majority of worms we identify are polychaetes, or segmented worms; and the vast majority of polychaetes, broken down as they are, are not reasonably identifiable to a lower taxon. However, common taxa we have been able to identify are Glycera, Pherusa affinis, Arabella iricolor, Ophelia denticulata, Travisia carnea, Nereis, Pectinaria gouldi, and Clymenella torquata. Our black sea bass sometimes eat Aphrodita hastata, or sea mouse, an atypical and bizarre-looking polychate. Our infrequent non-segmented worm encounters include sipunculids (peanut worms), nematodes (roundworms), acanthocephalans (spiny-headed worms), and echiurans (burrow worms). Regarding soft-bodied worms, it is important to note that when performing diet analysis using direct observation of stomach contents, these prey sources are very likely underrepresented. Because most likely the worms are broken apart and digested more quickly than prey types with a hard shell or scales, we may hypothesize that fishes consume more worms than we can observe and quantify in the stomach contents.